Mayon Volcano in the Philippines. 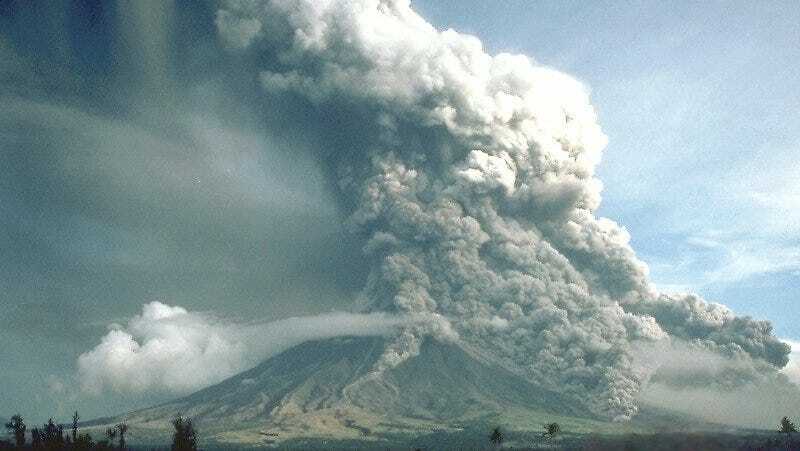 The researchers explored the question using an experiment called PELE, the Pyroclastic flow Eruption Large-scale Experiment. The experiment is essentially a large, heated container with a literal ton of aerated, natural volcanic particles which are then dropped onto a 40-foot-long, 1.5-foot-wide, high-friction chute that leads down to a concrete pad. It’s a sandpaper slide at the theme park of death. During the experiments, which the researchers recorded with a high-speed camera, the mixture separates into a denser underflow below and a 6-to-15-foot ash cloud above. The cloud would run to 115 feet, while the underflow would run up to 87 feet. The researchers performed a number of calculations and numerical modeling with the data and reviewed the footage. The saw that areas with fewer particles developed near the ground. They hypothesized that in these flows, faster-moving materials higher up generate higher-pressure regions closer to, but not quite on, the ground. This would cause gas particles to travel toward the lower-pressure region closer to the ground and inflate an air pocket on which the flow can slide nearly frictionlessly. There’s more work to do, as Alain Burgisser, scientist at the Université Savoie Mont Blanc in France wrote in a Nature Geoscience commentary: “The exact conditions under which this layer appears remain to be determined with precision.” But the effect is an exciting one to discover experimentally, and the researchers’ numerical modeling demonstrates that air lubrication could explain these pyroclastic flows in nature.